"A tasty way to serve Brussels sprouts." Preheat oven to 425 degrees F (220 degrees C). Lightly grease a baking sheet. Combine Brussels sprouts and onion together in a bowl; add 3 tablespoons olive oil, salt, and pepper and gently toss to coat. Spread sprouts mixture onto the prepared baking sheet. Bake in the preheated oven until sprouts and onion are tender and caramelized, 25 to 30 minutes. Heat remaining 2 tablespoons olive oil in a small skillet over medium-high heat; saute shallot until tender, about 5 minutes. Add balsamic vinegar and cook until glaze is slightly reduced, about 5 minutes. Stir rosemary into glaze and pour over sprouts mixture. 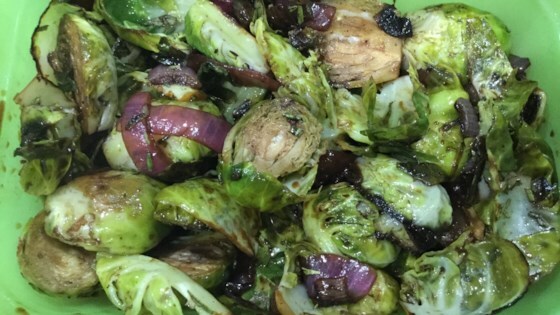 See how to make roasted Brussels sprouts and cipollini onions. Great recipe. I added a tiny bit of honey to the reduction. My little guy kept asking for more. Definitely a winner.